Premium motorcycles had a 45% contribution in Bajaj Auto's total revenue in January and February. The company aims to increase its profits in the premium category by expanding its product portfolio. Speaking to CNBC-TV18, Rakesh Sharma, Executive Director, Bajaj Auto talked about the company's growth outlook. Premium motorcycles contributed 45% to the total revenue for January and February. The company aims to expand its portfolio with more premium motorcycles. "January and February saw 45% revenue contribution from premium motorcycles", Sharma told the business publication. A couple of months for it to start to show up substantially in the blended margin. So if we continue on this track and that is our strategy to keep driving the premium end strongly at the expense of the high end of the commuter motorcycle in the industry. So we continue with that strategy, if it persists it will definitely impact the margins positively... Therefore, come April-May we will start to see a better exchange realisation because of hedging position. So that should also drop down to the margins. Last month, the Pulsar range crossed the 1 lakh sales milestone (domestic market) in a single month for the first time. It recorded a 39% Year-on-Year growth. The company expanded its Pulsar range with the launch of the Pulsar 180F, a semi-faired version of the Pulsar 180. 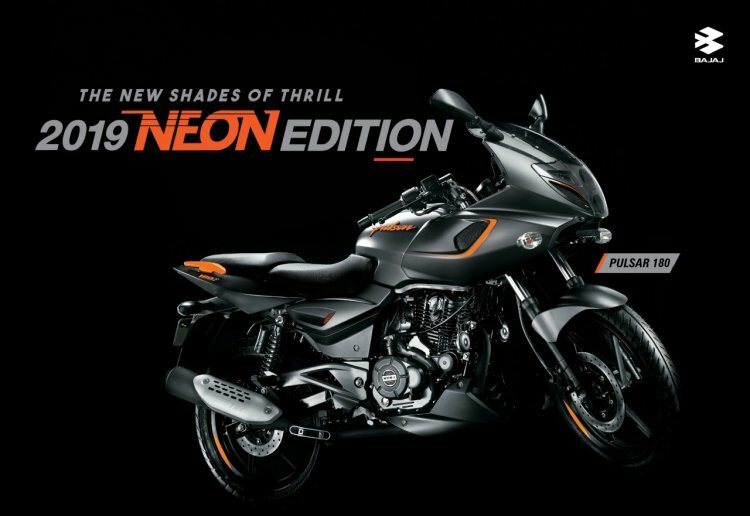 The motorcycle draws visual cues from the Pulsar 220F. On the 4th of this month, the company announced the launch of the 2019 iteration of its flagship motorcycle, the Dominar 400. The new model was launched in the country at an ex-showroom Delhi price tag of INR 1,73,870, a premium of just INR 10,795 over its predecessor. The company would expand the product portfolio of KTM also, likely with the 790 Duke, 790 Adventure, 390 Adventure and the RC125. The Pulsar range crossed the 1 lakh sales milestone (domestic market) in a single month for the first time in March 2019. Bajaj Auto expanded the Pulsar range with the launch of Pulsar 180F (pictured). Last month, Bajaj Auto announced a major reshuffle – third in last five years – after Amit Nandi, President of Probiking Business Unit announced his departure after 12 years of service. Sumeet Narang would replace Nandi. The company has appointed Sarang Kanade as the president of the motorcycle business while Eric Vas took over the company’s new unit, Urbanite Business.